Facebook has long relied on its own users to help translate the site into more than 65 different languages. Now, Facebook wants to unleash its army of volunteer translators on other sites and apps across the Web. Any site or app that use Facebook Connect can now tap into the Facebook community to get help translating their site into any language that Facebook Translations supports. As Facebook strives to cement itself as the social glue of the Web, offering free translation tools gives developers yet one more reason to choose Facebook Connect over Google Friend Connect or other competing platforms. It gives them access to new markets extremely quickly. 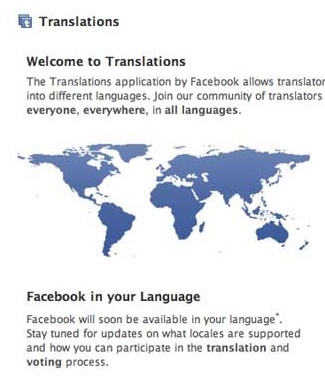 Facebook thinks its crowdsourced translation tools are so good that it’s patented them. The Internet is a global platform, which makes translation a must for sites both large and small. But the effort it takes to translate a site into many languages is expensive and time-consuming. Getting users to do the heavy lifting is appealing. Even if the translations aren’t top-notch off the bat, they will improve over time if enough people who speak a particular language care enough about a site to fix it.